“What did I just listen to?” This was my first thought as I finished the Audible version of Illuminae by Amie Kaufman and Jay Kristoff. Going into this book I knew very little. I had seen the book on the shelves for ages and heard about it on occasion through the Booktube community, but never picked it up at the bookstore. Honestly, if I hadn’t completely been loving audiobooks this year, I may have never picked up this series and that would have been a shame because it is EPIC! Illuminae is told in the form of a dossier. The dossier contains voice memos, journal entries, instant messages, schematics, radio communications, video analysis reports and many other documents. Now, I’m not the type of person who usually enjoys books written in this way, but the audiobook is so much more than anything I could have imagined. The audiobook is read by an entire cast which gives it more of a space opera radio show feel than an audiobook. The small additions of music and sounds really enhance the storytelling and I can honestly say I’ve never listened to an audiobook like it before and it makes me really want to get into listening to radio plays and similar audiobooks. The plot of this book is a mystery at the beginning and if you aren’t used to reading science fiction or well-versed in computer technology some of the discussion can be a bit confusing. Being that this is the first book in the series we definitely see the slow start as the world begins to develop and grow, but it doesn’t take long at all to become immersed in the lives of these characters and the mystery that surrounds them. There are a few different plot devices that grow then converge together to create a mind-blowing futuristic story. This book has it all as it crosses multiple genres that there is a little bit for everyone. It contains the genres of romance, science fiction, and thriller wrapped in a beautiful galactic bow. If the mysterious plot wasn’t enough to hook you into this book, having a full cast voicing the audio lets the listener really separate out the different characters and gives the characters more depth. For instance, the voice of Illuminae with its computerized mask is reminiscent of those voice changers we had as kids and it was a really interesting element and made me want to know who it really was under the voice changing software. I also enjoyed that we got to have a wide range of accents for the characters as well. It gave a trueness to the story of how in this futuristic environment we would see different people of different cultural backgrounds scattered throughout the universe and that added diversity to the characters made the story more believable. While the book does have a large cast of characters, Kady and Ezra are the two on which the story really revolves. Kady has a very sarcastic personality but is also very protective of those she cares about. Her character development over the story is so interesting and it makes you think about what you would do for those you love if you were in her situation. Ezra at first gives you that boy-next-door vibe that makes you think he is just going to be this annoyance to Kady and he has some ghosts in his closet. His past, as well as his love for Kady, is what I really think drives his character development and you get to see his caring nature and an inner strength appear as both his and Kady’s lives change in a drastic way and they have to help each other survive. Like our main characters, the authors worked together to create one seamless writing style. I would have never known that two people had written this book together if both their names hadn’t been on the cover. The writing style and the dossier format they chose as a means to tell this story really makes this book stand out compared to other YA Science Fiction novels. It truly hits the mark and I cannot wait to listen to Gemina and Obsidio in the coming months because I have no idea where this ride is going, but I’m in it for the long haul. 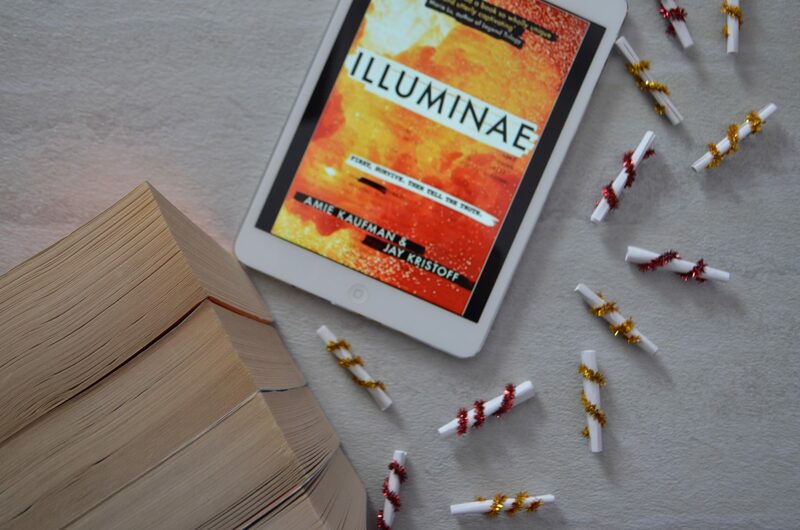 I hope you have enjoyed my review of Illuminae ( The Illuminae Files #1) by Amie Kaufman and Jay Kristoff. If you have read this book let me know your thoughts in the comments and help me build my TBR by letting me know your favorite YA Sci-Fi novel. I did! I’ve already listened to Gemina! I almost don’t want to read Obsidio because that means the series will be over.